Yes, indeed, despite the promise of impending labor Armageddon and a prolonged work-stoppage, your friends at Puck Daddy are previewing the 2012-13 NHL season (whenever the heck it starts). Why? 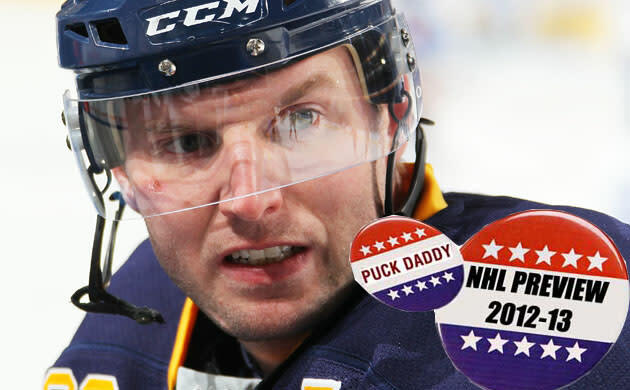 Because this is the most important election in the history of all-time ever, and you need to know the candidates — starting with the Buffalo Sabres. "Welcome to Pegulaville", Sabres fans said and were told last season when owner Terry Pegula broke open the chequebook and declared an end to the miserly ways of the past. Never has a one-percenter been so beloved by the middle class as during Pegula's first summer. Finally, the Sabres had the money to contend. Pegula went out and made up for the wrongs of July 2007, when Danny Briere and Chris Drury walked, signing skill guys like it was going out of style. Unfortunately, it was out of style -- the game had changed since 2007. The league was tougher, clutchier, and grabbier, and the Sabres discovered they had spent a lot of money getting more skill while failing to account for the grit factor. Granted, it didn't help that highly-paid acquisitions Christian Ehrhoff, Robyn Regehr and Ville Leino struggled to adjust to their new team, and the revamped roster struggled to find an identity as a result. Soon, the Sabres' identity was as an underachieving team at the bottom of the league, though a late-season turnaround provided some hope. A summer later, the Sabres opted not to spend to oblivion, instead deeming Derek Roy the expendable piece in their corps of tiny skill guys and using him to gritty up the roster. Furthermore, they left the rest of the team mostly intact, hoping the group that came together and made a run towards the playoffs last spring could continue that momentum. Can a tougher, more together Sabres get back to the postseason? "Get Fought by Ott and Scott"
The Sabres opted to curb spending in 2012. I mean, you could argue that they just had no one to spend money on, but Ville Leino can attest to the fact that this didn't stop them last year. Instead of throwing money around, the Sabres made a concerted effort to get tougher, a major issue even before Paul Gaustad -- the go-to anytime someone needed to be fought -- moved to Nashville at last year's trade deadline. Gone to Dallas is smallish centre Derek Roy, and in exchange come gritty centre Steve Ott and 6-4 defenceman Adam Pardy. But the Sabres didn't stop there. Still in search of grit, Pegula offered a front-loaded deal to Rooster Cogburn, only to be told he wasn't real, so instead, the Sabres added 6'8" John Scott on the first day of free agency. The next time someone tries to run over Ryan Miller, John Scott will be there. The next time someone tries to take a run at Thomas Vanek along the boards, John Scott will be there. The next time there's a brawl between the Sabres and the Bruins and someone has to square off with Zdeno Chara, John Scott will be there. By "there", I mean the bench. But still. There's no missing him -- he's quite tall. Also gone is Brad Boyes, who didn't do too much anyway, so that's okay. At forward … the Sabres will continue to rely on the scoring touch and chemistry of wingers Thomas Vanek and Jason Pominville, as well as a platoon of depth wingers that includes Drew Stafford, Nathan Gerbe, Ville Leino, and Marcus Foligno. Their issue will be up the middle, where tiny converted winger Tyler Ennis, sophomore Cody Hodgson and checker Steve Ott will centre the top three lines. Luke Adam will likely get a look as well, but even with him in the fold, this is hardly a formidable group. Worse, there's little wiggle room. If anyone struggles or is injured, the team could be in trouble. On defense … Tyler Myers leads a defence corps that also includes Christian Ehrhoff, Robyn Regehr and the seriously underrated Jordan Leopold. It's an imposing top-4 if everyone is in the lineup and on their game, but injuries and middling performances left Alexander Sulzer looking like a top pairing option on Buffalo late last year. That can't happen again. The Sabres need bounceback years from Regehr and Ehrhoff especially. Regehr looked old and slow in his first year in Buffalo, but some of that might just have been adjustment. The Eastern Conference is a little more free-flowing than the West, and Buffalo is a lot more free-flowing than Calgary. He needs to find his game again in a hurry. Ehrhoff will never be confused for a shutdown guy, but he didn't outscore his defensive lapses in 2011-12 like he has in years past. The Sabres need more out of him, especially on the powerplay. In goal … Ryan Miller looks to return to form after a season that had some questioning if rookie Jhonas Enroth should be the new number one. Enroth was viewed as a pleasant surprise, but if we're being fair, a team with Ryan Miller on it should never be questioning if the rookie behind him is better. Miller needs to re-find his form. "Injured Sabres" is a moving tribute to the men that have sacrificed their bodies in the Sabres' pursuit of victory. Same as it ever was. Lindy Ruff and Darcy Regier enter their 15th year as coach and GM, respectively. It's no doubt a cushy gig, but with Terry Pegula desperate for a winner, one has to wonder if the other end of their leash might actually be tied to something now. Would a second straight year without making the playoffs be enough for either of them to actually reach the end of it? Ruff especially has to consider himself on the hot seat. Buffalo won't have success unless Ryan Miller is on his game, and tweaking his system to give Miller a bit more support couldn't hurt. If he doesn't, the Sabres might have to find someone who will. Tyler Myers. After a 48-point rookie season, Myers had 60 points in the following two seasons combined. Last November, he even suffered the ignominy of a healthy scratch. The hulking Sabres blueliner is one of only three defencemen with massive signing bonuses unaffected by the impending lockout. The other two are cornerstones Ryan Suter and Shea Weber. It's time for Myers to begin showing he belongs in that group. Cody Hodgson was never going to crack the top six as a centre in Vancouver, but in Buffalo, he's practically all there is, especially with Derek Roy gone. Tiny Tyler Ennis will likely open the season as the first line centre, but the Sabres are counting on Hodgson to push him for that job and, ideally, take it. If he can't meet their expectations, Buffalo's going to struggle to score all year. Ville Leino. It's hardly a nervy pick after Leino collected $4.5 million last year to score 25 points, but he can still bust harder. Another year with numbers like that and fans are going to hate his guts, especially if Buffalo's weakness at centre -- Leino's listed position -- begins to show. Narrator: "The Buffalo Sabres want you to believe they're willing to spend to win. They think offering $28 million for Shane Doan is proof. But they spent $27 million on Ville Leino last year. Do they really think Shane Doan is only worth $1 million more than Ville Leino? The only thing this proves is that they're returning to their cheapskate ways after just one year. Been there, done that. Pegulaville? More like No-moolah-ville. Write a cheque, Scrooge." "Paid for by the Friends of Terry Bross Foundation." Another year on the bubble. The Sabres could very well make the playoffs, but everything's going to have to go right for them. Tyler Ennis and Cody Hodgson are going to have to play like top-six centres. Tyler Myers is going to have to become a true number one guy. Ryan Miller is going to have to be one of the best goalies in the league again. Every one of these things is possible, but all of these things happening is less so. Expect the Sabres to be in contention right up until the final week of the season.